With spring now officially here, Reepham Good Neighbour Scheme’s allotment is welcoming anyone who would like to help out or just visit the site off Stony Lane in Reepham (plot 12B). 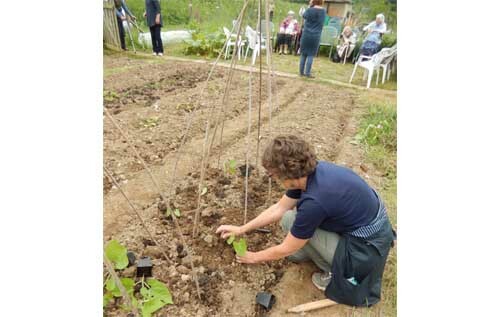 The volunteer-run scheme’s “Never Alone in Reepham” allotment project aims to provide an environment where anyone can come along and reconnect with plants and growing, no matter what the level of their horticultural skills. Perhaps you are a former allotment holder who has had to give up a regular commitment but would still like to stay in touch with the earth? Maybe you are new to gardening and would like to learn a few basic skills from those who have more experience? Or perhaps you would just like to sit in the fresh air, enjoy watching others work and have a mardle with whoever is about? It is planned to have a RGNS volunteer at the allotment each Thursday afternoon and Saturday morning. Transport can usually be arranged with a little advance notice. For more information or to book a lift, please contact Lin Garland 01603 879269 or Linda Fullegar 01603 870945.